24 April 2018 This week, as I was not training for nor running in the London marathon, I had the opportunity to hear a myriad of haunting voices through Tamar Harpaz, Tayrn Simon and Italo Calvino. On Tuesday I headed over to Edel Assanti to see Crazy Delay, Harpaz’s first UK solo show. That very evening the gallery was hosting a conversation between the artist herself and Laurence Sillars, Head of Exhibitions at the Henry Moore Foundation. Prior to the talk though we were invited to keep quiet and listen to the story presented in its full loop. After being confronted with apparently disjoined objects we see how each of them is connected through a mechanical sequence. We feel the guitar case reverberating heavily, we listen for a tea cup from which Harpaz’s friend calls for her, a human heartbeat, a prayer. In conversation with Sillars, Harpaz revealed that for the sequence to work it required natural light which proved difficult given the gallery’s location in London. Hence the slanted glass panels, tinted yellow and orange, came about – enhancing both the reverberations and compensating for the warm light which London’s blue-grey skies lack. Sillars and Harpaz also explored the cinematic nature of her show – with the artist expanding on the notion of objects in silent films and how these would absorb and reveal sounds when prompted, much like the ‘black boxes’ upstairs, each of them becoming narrators. Our agency as viewers was also questioned. In particular whether we were free to be drawn to the different objects during the full loop – some compared our movements to dance – or whether we were being manipulated by them, meaning our dance had been in fact staged without us being aware of it. The talk was an incredible way to explore the show in all its facets and have an understanding of Harpaz’s personal fascinations as an artist, for instance, that of creating real pre-mirror images. Whilst the show at Edel Assanti closed on 21 April, Harpaz will have a solo show at the Tel Aviv Museum of Art later this year, which will undoubtedly prove to be exciting. The link to her talk with Sillars can be found here. The following night I could not contain my anticipation for Taryn Simon’s ‘An Occupation of Loss’. Simon had first performed the work in New York in 2016 during Park Avenue Armory but, with the courtesy of Artangel, brought it to London in a subterranean dodecagon. The space – an architectural dream – took four years to find and was definitely born to host this particular work. With its multiple tiers and nooks sound appears to bounce and echo in peculiar ways, cutting off in certain parts of the structure and enhancing sound waves in others. Photography was not allowed during the night so other than the first photograph I took effectively above ground I’m afraid I can only document my experience through words (but Artangel helpfully has great photos of the space for those interested). The last show of Simon’s I had seen was at Gagosian in Rome, namely Paperwork and the Will of Capital. Simon’s methodical and meticulous research was apparent then, as is now. In bringing together 21 professional mourners from across the world she details the procedure incurred in allowing each of the performers to be in London – their visa applications, statements that would support them entering the country. This account is distributed as a booklet to the audience at the end of the performance, allowing it to carry on, albeit being inherently transient. Upon walking down into the space – in utter silence – we see two sets of neon beams which act as a spiritual gate. Whilst the mourners sing their songs of grief – be this in a traditional way or in a more contemporary fashion, such as the Chinese mourner using synths – we are invited to walk around the dodecagon and face each of the performers. In doing so we feel their laments permeating us and, whilst we may not share the same religion, we understand the universality of grief all the more when standing in the hollow space at the very bottom of the structure where all the voices come together, blending in between the white beams. Just as Simon’s performance, despite focusing on a shared common experience, one that makes us human, was unspecific – allowing us to connect with the mourners in our own ways – in the same way Italo Calvino’s Le Citta’ Invisibili (Invisible Cities) is geographically unspecific yet capable of capturing and insinuating itself in our reality. As an Italian it is perhaps difficult not to adore Calvino’s works so when I walked into Waddington Custot for its latest show ‘Invisible Cities: Architecture of a Line’, curated by Flavia Frigeri, I knew I was going to enjoy it. The exhibition is inspired by Calvino’s novel in which Marco Polo and Kublai Khan have an imaginary conversation, detailing stunning cities and landscapes which are completely fictional. 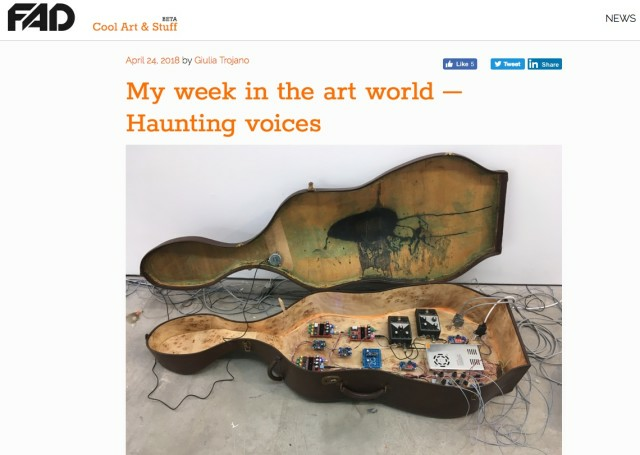 Whilst the gallery itself did not have any soundscapes, the works on display and their connection to our novelist amounted to melodic dialogue which accompanied me around the space. Now the metaphysical is very much my realm and, when curating a show that would enable artists to see Calvino’s invisible cities, one cannot but include de Chirico (you can read me hyperventilating about how stunning the de Chirico show at Nahmad Projects was here). We find his classic portico, his lime green hues, his metaphysical landscape that I would want to inhabit, greeting us. Calvino himself described de Chirico’s work as ‘the city of the mind’ and from there we continue guided by Melotti’s sculptures. The author met Melotti whilst writing his novel and owes his thin city to the sculptor’s modernist metal creations which he saw as visions of a utopian urban landscape. Although stunning works by Maria Helena Vieira de Silva, Gego and Paolini are also presented, the other artist I was incredibly drawn to was Shusaku Arakawa. He too was moved to explore utopian architecture and did so with poet Madeline Gins with whom he conceived ‘reversible destiny architecture’. The works on show indicate Arakawa’s transition from painting and drawing floorplans, blue-prints and diagrams into conceptualising these and imbuing them with an idealistic view of what architecture can achieve.